After I bake the scones, I totally change my impression toward it. The recipe shared by Wendy are fantastic! The scone are soft and yummy. Not too sweet and it's best eaten warm with some butter or fruit jam. However, I still prefer the eat them with butter. Do give it a try!! 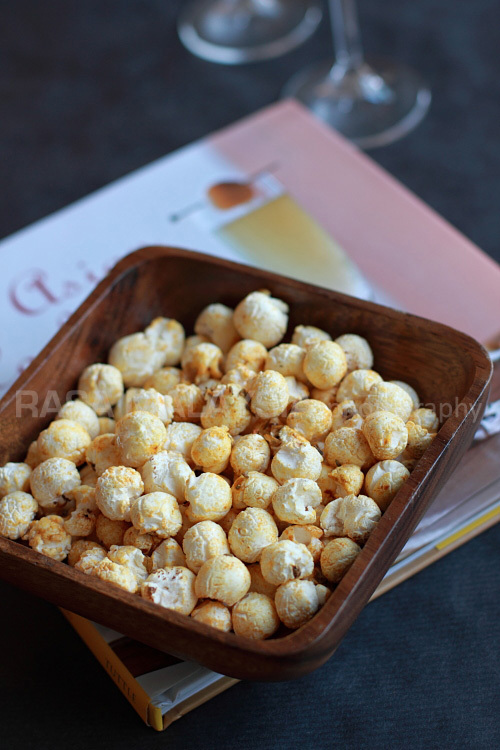 I was lazy to retyped the recipe and please feel free to click HERE for the recipe from The Adventure Of Giggles! 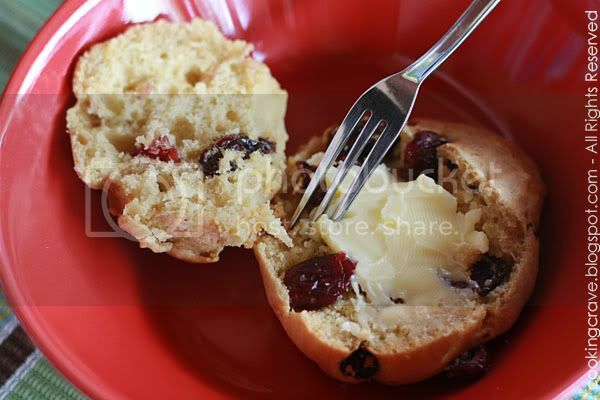 **I substitute the blueberries with the same amount of dried cranberries & raisins mixture. WOW! I like this one, please keep some for me. haha.... finally you post it!! Good job! 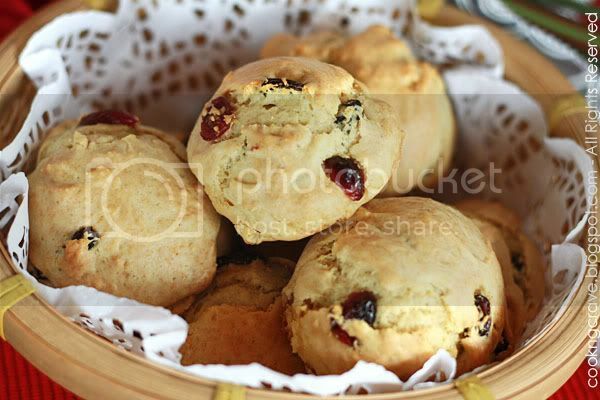 I did cranberry scone earlier too, but have yet to post it out, anyway your scone look really delicious, good job. This really tempting me to make some scones now. After reading HHB blog about her scones and now you've a beautifully baked scones...I think I must go back to my daily routine of scones baking. Thanks for inspiring me, cheers! really Amy, i envy u so much.. u r really a good cook! Really nice blog. Will keep to visit you! cranberryyy?? expensive scones leh.. haha..
Giggle: Yup, thanks for the recipe sweetie! Sonia: Thank you. 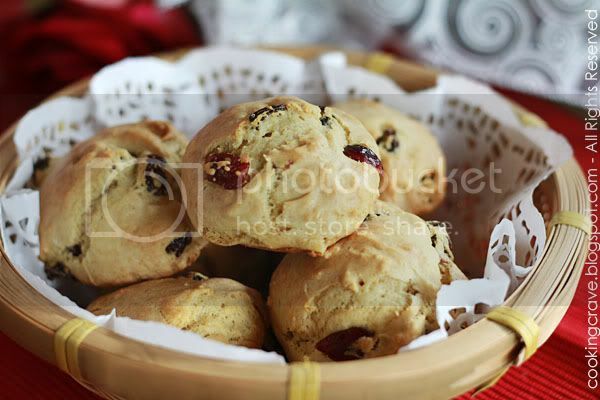 I use dried cranberries and organic raisins, it taste marvellous and the scone are soft. Grace: You are welcome! I will be waiting patiently for your scone recipe. Claire: Thank you and I wish to see your cooking too. CherryPotato: Thank you so much. You've got a nice blog too. I love scones! I couldn't hold my saliva when seeing this, you did a great job. And also, every photo looks so nice and the food is yummy! Yen Lin: Thank you and welcome to my Blog!